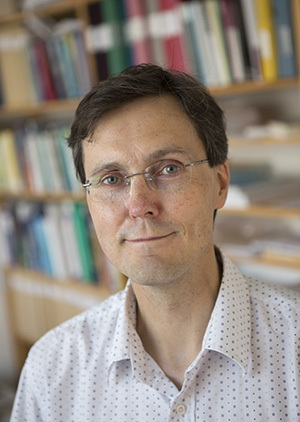 Welcome, Tomas Furmark, Professor in the Department of Psychology. You’ve received research funding from the Swedish Foundation for Humanities and Social Sciences to examine the chemical processes behind shyness and social anxiety disorder. What do we know today about brain chemistry in shyness and social anxiety? Why is the brain’s reward system involved in shyness? How will you examine the chemistry of shyness? But aren’t there drugs for social anxiety disorder? By marking a substance that can be examined with a radioactive marker, the researcher gets a three-dimensional image of where the substance is located in e.g. the brain. Using powerful magnetism and radio waves, the water molecules in the body emit radio waves that are captured in an image. In functional magnetic resonance imaging, the image is taken during some type of activity, for example, when the patient is looking at pictures. Magnetic resonance imaging is commonly called MRI. Selective serotonin reuptake inhibitors, SSRIs, are commonly called “happy pills”. SSRI drugs block the re-absorption of the neurotransmitter serotonin in nerve cell synapses. The drugs were developed to alleviate depression, but have been proven to also work for e.g. social anxiety disorder.